I went to church every Sunday for 12 years, and as a kid I enjoyed it honestly. 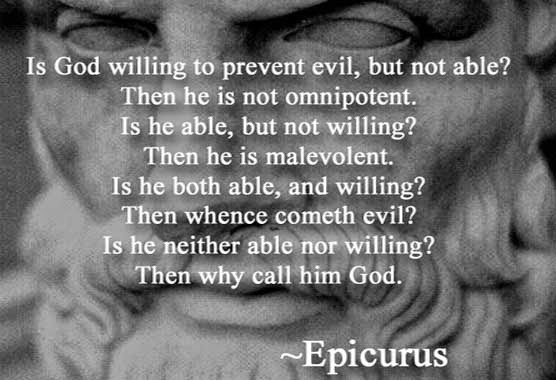 But around the age of 12, I questioned it heavily and read the famous Epicurus quote and showed it to my grandmother. She said how dare I question the Bible and had to hang out with the pastor for an extra hour. I then read Friederich Nietzsche quotes and watched the YouTube user Thunderf00t and his mind-opening knowledge of science he wants everyone to embrace. But, I still feared the idea of Hell so it took me until the age of 13 to leave it completely. For one, the people at my church were VERY condescending, pretentious, and actually very unintelligent. Also the pastor thinks he knows a lot about physics because he took algebra-based physics in college. Throughout high school I was a militant atheist, and Westboro Baptist Church came to my school (Glen Burnie High School) and I was on the frontline counter-protesting them, it was VERYA liberating. But now as I am about to enter college I am only agnostic atheist because I would like to be open-minded in case new evidence would for whatever reason disprove my position. But anyways, I truly feel sorry for fundamentalist Christians. I support religions and philosophies that support freethinking. Nietzsche said there is no one higher truth, everyone has their own "capital T", higher truth. And in AP World History it was mind-boggling that Christianity was so cruel to anyone different. We live in the USA where we have what is called SEPERATION OF CHURCH AND STATE. Obviously the Christians can't wrap around their head that not everyone is Christian and not everyone believes in their causes. So my advice to anyone questioning their own religion/philosophy or lack thereof? Find your capital T, and follow it. However, keep your mind open still even after that, use the scientific method, not the faith based one Christianity enforces.